If there is one breakfast item we love, its bagels! They are one of the most perfect breakfast foods! So when we found out Chompie’s was releasing new flavors, we were beside ourselves with excitement! We already love the bagels at Chompie’s and we were sure we’d love these as well. 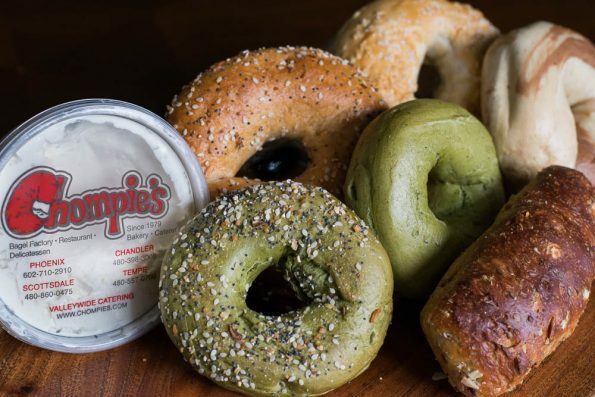 The Spinach bagels take Chompie’s original plain bagel and add finely ground spinach. The result is an earthy flavor that’s a perfect complement to sandwiches or a cream cheese spread. The Pretzel Bagels come just in time for Oktoberfest. Chompie’s boils these bagels in pretzel-like solution of baking soda and water then tops them with a thick, Kosher pretzel salt. Chompie’s new Protein Bar is a variation of its Carbs. Not low carb bread that’s a popular option for the health and fitness conscious. The bar looks like a mini bread loaf and starts with the same Carbs… Not dough. From there, Chompie’s adds in flax seeds, sunflower seeds, cranberries and sliced almonds. The bar has 30 grams of protein and 6 net grams of carbohydrates. As expected, all of the flavors were fantastic! The flavors that really shined for us were the Spinach and Spinach Everything bagels. We were hesitant when we heard about the spinach in the bagel. Would it be too “earthy”? The answer is no! It’s actually a unique change from the typical bagel. We really enjoyed it with avocado as well! For those of you with a sweet tooth the Banana Chocolate Chip Swirl is for you! It’s great toasted and with a bit of butter. We both don’t have a huge sweet tooth but these bagels are just enough sweet to be a good bagel when you don’t feel like the sweetness of a muffin or danish. We can’t wait to add these bagels to our breakfast line up! 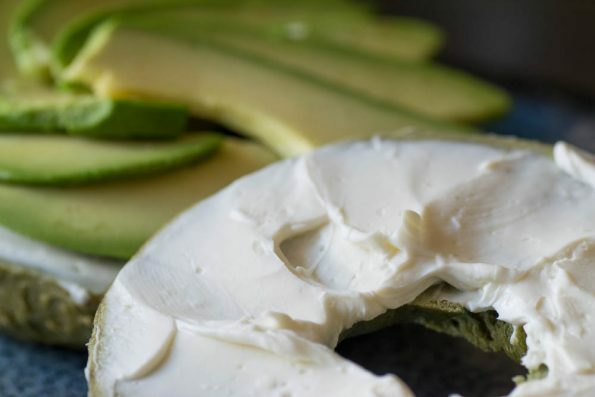 What are your favorite ways to eat bagels? Favorite flavors? Toppings? We’d love to hear all about it! Leave a comment below or use the hashtag #GeekEats! *The Geeks were given comped items to facilitate this write-up; We were also provided information about the new bagel flavors. All opinions are wholly our own. View our Disclosure Policy for more info. Kite Hill Plain cream cheese topped with green olives or kalamata olives, tomato and cucumber are my favorite toppings. Think they’d go great with a spinach everything bagel!